Pictured are (from left) David Mooney, College of Fellows chair; Dawn Elliott, UD biomedical engineering program director; and Ralph Lee, president of AIMBE. 11:25 a.m., March 6, 2013--Dawn Elliott, director of the biomedical engineering program at the University of Delaware, has been elected to the American Institute for Medical and Biological Engineering (AIMBE) College of Fellows as a member of the Class of 2013. She was also named a fellow of the American Society of Mechanical Engineers (ASME). AIMBE college fellows are considered the “life-blood” of the bioengineering community and rank among the top two percent in their field. Elliott joins 1,000 elite bioengineers in academia, industry and government who have been selected for this designation. 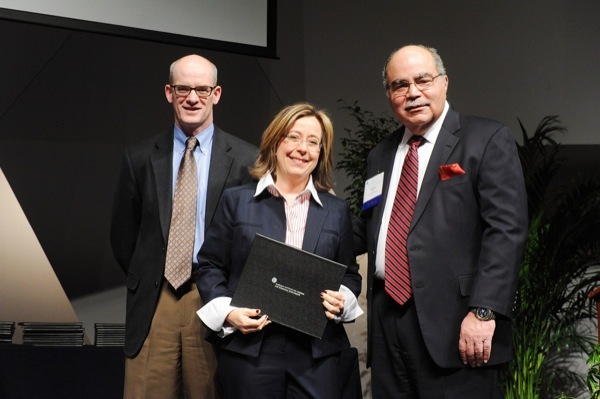 Elliott was formally inducted into the AIMBE 2013 Class of Fellows for her research on intervertebral disc degeneration. The induction ceremony took place at the National Academy of Sciences Great Hall in Washington, D.C., on Feb. 18. She was inducted as a 2012-13 ASME Fellow last fall, specifically, for her research on the mechanical factors surrounding intervertebral disc degeneration. Elliott joined UD in 2011 to advance the College of Engineering’s fledgling biomedical engineering program, which began in 2010. Under her leadership, the program has developed a strong foothold on campus, with over 50 affiliated faculty performing interdisciplinary biomedical engineering research and a waiting list for students hoping to join the major. Now in its third year, the undergraduate program contains 160 students. Thirty-one percent of students are Honors Program students, about half are Delawareans and more than 40 percent are female. Biomedical engineering also welcomed seven graduate students this fall to its new doctoral program. Elliott spent 12 years in the University of Pennsylvania’s departments of Orthopaedic Surgery and Bioengineering and is a proven leader in research. She is internationally known for her research on osteoarthritis and lower back pain, studying how and why the intervertebral spine and cartilage break down with aging and developing and testing therapeutics used in treatment. She earned her doctoral degree in biomedical engineering from Duke University in 1999. Additionally, she has served on the Bioengineering Division executive committee for the ASME and in 2012 chaired the Summer Bioengineering Conference in Puerto Rico.